Miss Lueffie apparently took umbrage to that statement. She pissed on the miscreant! She discovered a new way to leak. She pissed a cup of brownish water directly on TheMrs’s head! That had never happened before…. So now because of careless words _I_ have a project. The front seam is sealed with Eternabond, Larmer rebedded the cabover windows very well, the seams of the cabover are sealed with 3M 5200 _over_ POR-15. Thanks very much. Piss on you! Miss Lueffie’s furnace now works! We’re finally ready to boon dock! Furnace now has a brand new control board, so no new furnace needed! Wow, the heater will run you out. We’re leaving March 1 and headed northern bound. Grant it, we’ll stay at campground most of the time, but, boon docking sounds so cool. 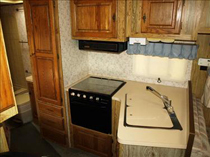 Between the generator for power when needed and a workable furnace, traveling will certainly be better. One should never consider heading northward without heat like mountain child did back in late April of last year! Lesson learned. Heading back south in late November was really cold and the little heater we had just didn’t cut it on some cold nights. 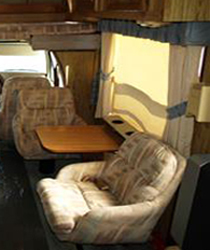 For an RV that’s gracefully aging, she’s had some serious TLC! Until next time. 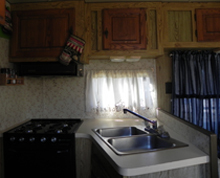 Below is a pic of our RV kitchen when we first bought it last year. The next one is after the recent changes. The old 1988 Yellowstone Class C’s had a very dull color combination on the wooden cabinets and walls, that will soon change. With a few brighter colors, it already looks better. I removed the box frame from the top of the window and shades and replaced it with a simple white and lace small curtain. It already looks brighter, modern and more spacious. We will be replacing all the old dull yellow light fixtures above the sink and on the ceilings with new brighter white LED lights and repainting the ceilings white. The bedroom and living room have already had the old box frames removed from the tops of each window, and shades. 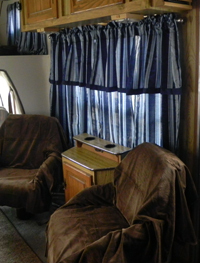 Replacing that with a simple curtain rod that is flush with the walls, the room already looks and feels larger. Brighter and more like home with matching curtains throughout. The bar area has a hide away table, when placed back inside the bar, new set covers and drapes, a little paint and wow!